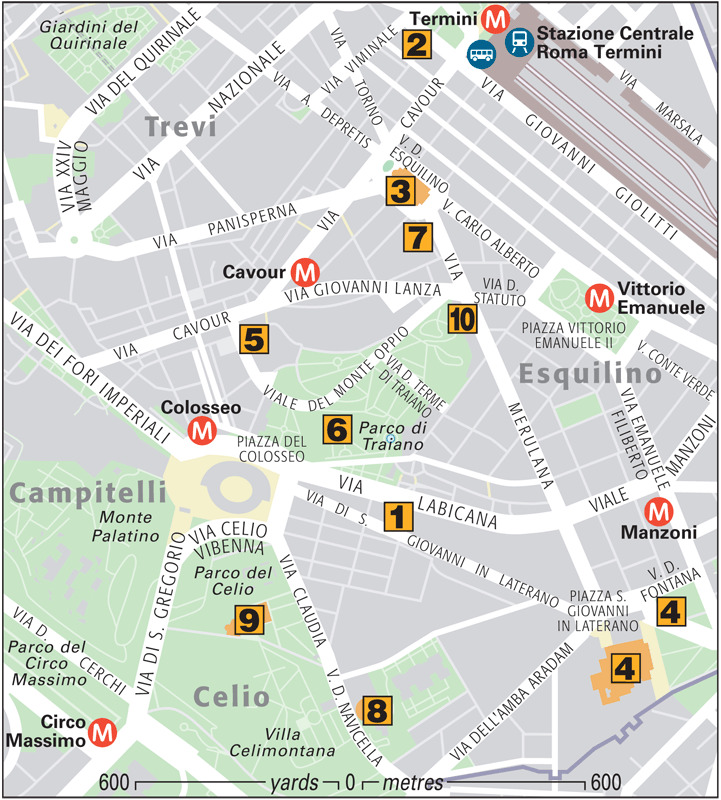 In ancient times the largest of Rome’s seven hills was almost entirely residential, consisting mostly of upper-class villas. 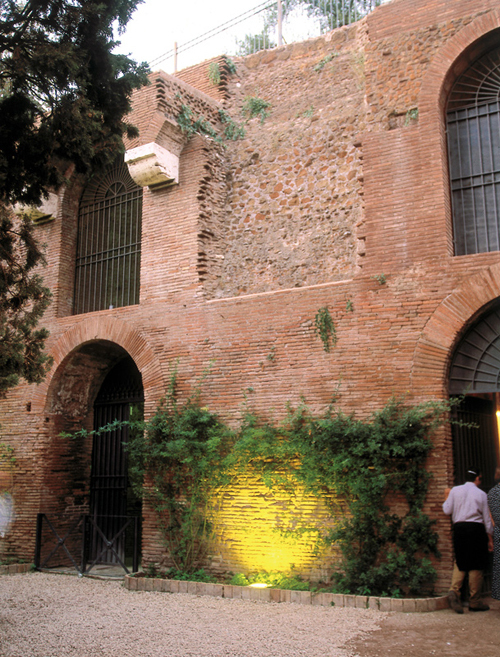 The western slope of the quarter, just behind the Imperial Fora was considered rather unhealthy as it was densely populated – the massive wall at the back of the Fora was intended to keep the squalid slum out. 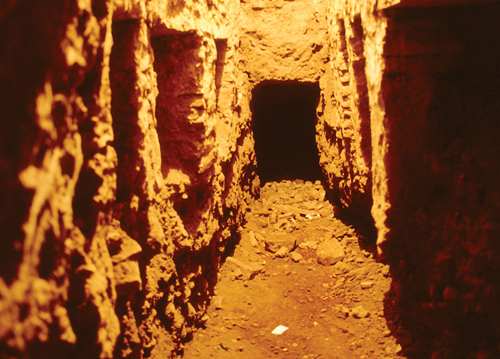 However, in the 4th century, this zone became central to the development of Christianity. In setting up the religion as the official faith, Constantine did not dare step on too many pagan toes, so he established Christian centres outside of town, on the sites of holy tombs. The main one was what is now San Giovanni in Laterano (Saint John in Lateran). Other churches quickly followed, culminating in the striking Santa Maria Maggiore, built in the 5th century. The district remains steeped in history and religious mystique. This area played a central role in early Christianity. Although Constantine himself was not a convinced convert, his mother, St Helena, was indefatigable in her promotion of the new religion. She convinced her son to found the official seat of the Bishop of Rome on the site of the ancient Laterani family villa, which his wife Fausta had inherited. Architectural layers of this church unravel Rome’s history, from the 2nd century BC to the 15th century AD . Housing an extraordinary collection of ancient frescoes, mosaics and sculpture, this branch of the Museo Nazionale Romano is perhaps the most inspiring. The building itself was erected by the Massimo family at the end of the 19th century and later served as a Jesuit college . This church is a unique blend of architectural styles. The nave and its mosaics are original 5th-century; the Cosmatesque work, the apse mosaics and the Romanesque bell tower are medieval; the coffered ceiling (of New-World gold) is Renaissance; and the twin domes and front and back façades are Baroque. 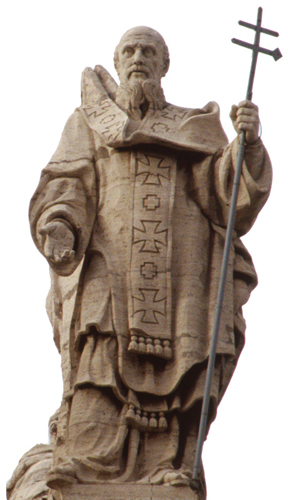 Pope Sixtus V erected the Egyptian obelisk in 1587 as part of his overall town-planning, to provide landmarks for pilgrims. The column in front was taken from the Basilica of Maxentius and Constantine in 1615 . Besides its grandiose Baroque bulk, visible from all over Rome, this former papal complex boasts the world’s first baptistry, its octagonal shape the model for all those to come. A building on the piazza houses the Scala Santa, claimed to be the staircase from Pontius Pilate’s house that Jesus ascended to face his trial – the devout climb the 28 steps on their knees. Tradition says that the stairs were brought from Jerusalem by St Helena, mother of Emperor Constantine . Michelangelo’s Moses is the unmissable experience here. Weirdly horned and glaring, the righteously indignant patriarch is about to smash the tablets down in outrage at his people’s idolatry. 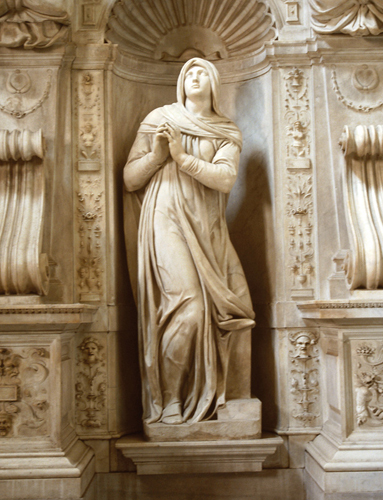 This powerful sculpture was just one of 40 the artist planned, but never finished, for the tomb of Pope Julius II. It has recently been restored. The original shrine was built in the 4th century to house the chains supposedly used to bind St Peter in prison. It has been rebuilt since, first in the 8th century and again in the 15th century. Subsequent emperors were so embarrassed by Nero’s gargantuan profligacy that they went to great lengths to undo as much of it as they could. One way was to give some of the land Nero took for himself back to the use of the Roman people. The Flavians drained his lake and built the Colosseum, to provide the citizenry with a suitable place for their gladiatorial spectacles. Then Trajan built Rome’s first great bath complex by cutting through Nero’s original house and building right over it . Built in the 9th century over a 2nd-century oratory, the original design is still discernible despite restorations. In the central nave, a stone slab covers the well where St Prassede is said to have buried 2,000 martyrs. Byzantine artists decorated the apse with mosaics depicting saints, lambs, palm trees and poppies. 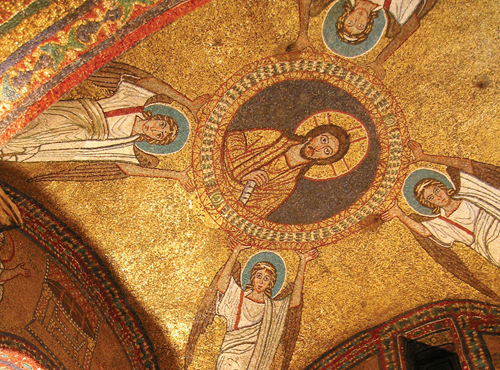 The walls and vaults of the Chapel of St Zeno also have mosaics from the same period, and there is a fragment of the column Christ was bound to when he was flogged. The unusual shape of this early church (468–83) may mean it was built over Nero’s round Macellum Magnum (meat market). Or perhaps its form was inspired by Jerusalem’s Church of the Holy Sepulchre. Whatever the case, recent digs have found a Mithraeum underneath. The structure is a peaceful, delightful sanctuary, situated far from urban uproar, although 16th-century frescoes by Niccolò Pomarancio depict martyrdoms in sadistic fashion. The eponymous saints were 4th-century martyrs and their home is still seen under the 5th-century structure. They were beheaded here in 361 on orders from Emperor Julian. Except for the Late Baroque interior, much of the church is pure medieval. 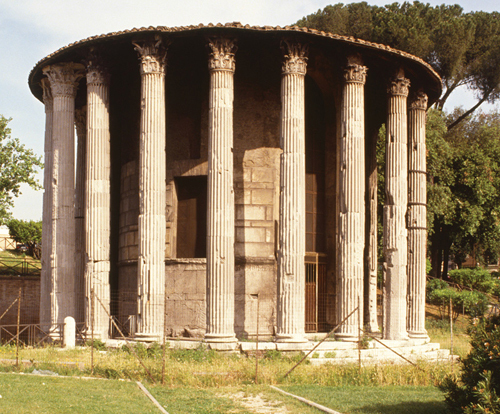 The base of the bell tower is that of the 1st-century Temple of Claudius that once stood here. A fine, though small collection of Middle and Far Eastern art, ranging from prehistoric Persian ceramics to 18th-century Tibetan paintings. The most fascinating works are the Ghandharan. These 3rd-century BC to 10th-century AD Indian Buddhist works display both Asian and Greek influences, due to the conquest of the area that is now Pakistan by Alexander the Great.